Ultimate Shield, made using a patented combination of stainless steel wire, encapsulated in a sheath of polyethylene and wrapped in high performance polyester. 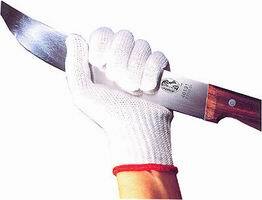 Knife Shield, the highest level of protection and cut resistance. Soft, flexible, bright white with Spectra. Performance Shield, very good cut resistance. Comfortable, flexible, bright white, lighter weight with Spectra. All available in small, medium and large.